• Sources: SRNSW: NRS10957, [1/3356-1/3357] , Reports of crime etc. for police information, 1856-61, R3128-3129. SRNSW: NRS10958, [1/3197-1/3234], Police Gazette, NSW, 1862-1899, R3129-3143. 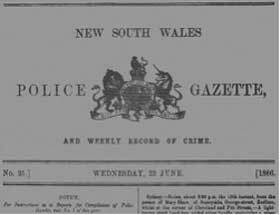 SRNSW: NRS10958, [1/3235-1/3265], Police Gazette, NSW, 1900-1930, R3594-3606. PACMM – Prisoners’ Afforestation Camp.